Commencement Ceremonies May 3 at 2:30 Live stream video for both undergraduate and graduate ceremonies will be available. Mark Conger Receives Golden Apple Award The award honors an outstanding teacher, and is the only University award selected by students. Undergraduate Program Discover the endless possibilities of an undergraduate mathematics degree here at the University of Michigan! Graduate Program Explore one of the world's top ranked mathematics graduate programs. 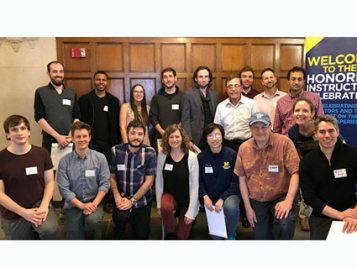 Pictured are many of the Mathematics faculty, lecturers, postdocs, and graduate students who received this recognition from students. We strive to support our students and faculty on the leading edge of learning and research; to steward our planet, our community, our campus. To do this, the Department of Mathematics needs you—because the world needs Victors.